Moissanite's brilliance, hardness, weight and scratch resistance rival all other gemstones. This gemstone possesses all the romance and passion of rubies, emeralds and sapphires. Moissanite is found only in meteorites and in limited areas beneath the earth's surface. In the past year, the quality of Moissanite has gotten very consistent. We still hand-pick only the finest stones !!! While diamond grading scale does not technically apply to moissanite, for the purpose of comparison most experts compare moissanite to diamonds in the I-J Color range & VS1-VVS Clarity. Since lab-created Moissanite has the closest physical properties to that of a diamond, it tests as a "diamond" on conventional diamond testers. Many jewelers cannot tell the difference from a diamond!!! Moissanite actually has a higher "refractive index" than diamond, which gives it MORE sparkle & "fire" than diamonds !!! Unlike CZs which are totally flawless & colorless, Moissanite does have a slightly darker (I-J) color & some very slight flaws (VS1-VVS) visible only under magnification. All of our stones are hand-picked to meet these specifications !! Beware of "bargains" on lower quality stones (especially stones released over a year ago). Moissanite's very high refractive index ("fire") also allows Moissanite to better retain it's fire if it gets dirty, oily, or smudged, (unlike CZs that look very dull when dirty). 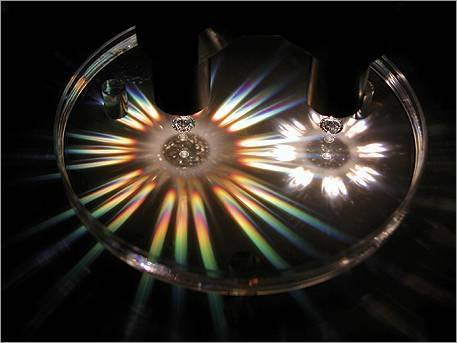 Charles & Colvard developed this JFIRE Unit to demonstrate the superior optical properties of Moissanite. Using a relatively simple technique of shining a light source through a similar sized moissanite jewel and diamond placed in water, the JFIRE Unit dramatically demonstrates the superior fire and brilliance of moissanite. The history of natural Moissanite can be traced back to the late 1800's, and a man who later became a Nobel Prize winner. Dr. Henri Moissan discovered natural silicon carbide in Arizona, while analyzing part of the Diablo Canyon meteorite, in 1893. The mineral name for silicon carbide, Moissanite, was given in Dr. Moissan's honor in 1905. Moissanite's essence was the potential for an absolutely shimmering brilliance, fire, luster, and incredible hardness. Unfortunately, the supply of natural moissanite wasn't large enough even to create a pair of earrings. Naturally occurring moissanite is extremely rare and found only in microscopic crystals that are too small to use in jewelry. Only after years of research a breakthrough discovery enabled the production of moissanite crystals large enough to produce an uncommon combination of science and art. We have been carrying Moissanite since 1998! The first & oldest Moissanite dealer in the world ! We have two "Charles & Colvard Certified Moissanite Jewelers" on staff. We carry only the top-quality Charles & Colvard stones, no seconds, imperfect stones, etc. We do not carry any of the older stones that were prone to color inconsistency. Since all the gem quality Moissanite is lab-created, by Charles & Colvard, the stones currently being released are all almost identical in quality. While the diamond grading scale does not technically apply to Moissanite, for the purpose of comparison most experts compare Moissanite to diamonds in the I-J Color range & VS1-VVS Clarity. Round stones seem to be more consistent & generally appear slightly whiter than fancy cuts. Similar quality diamonds would cost ten times this!!! To further insure only the finest stones, ours are hand-picked from a large "parcel" selection. We particularly avoid any "greenish" tinted stones. Moissanite is virtually undetectable as a diamond simulant by standard diamond testers & even by most jewelers.